Every year at HIMSS there’s too much going on and not enough time to write about it. We try to hit as many booths as possible while attempting to attend some educational sessions as well, but there just aren’t enough hours to do it all. I had several sheets of notes in my bag, so please bear with my somewhat rambling wrap up. 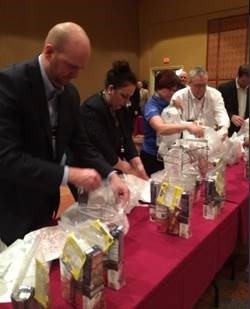 Someone reached out to me over the weekend to follow up and share photos of the Verisk Health service project benefitting the Second Harvest Food Bank. I had mentioned last week about seeing the woman in the carrot costume at the Phytel booth and didn’t realize that Verisk Health was the main sponsor. 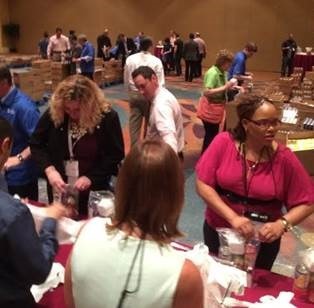 They ended up with over 250 HIMSS participants who prepared 4,100 food packs for kids. Thanks to those who turned out to help. They are planning to host similar events at AHIP and NHCAA, so if you’re attending either of those events, keep an eye out for the location and time. Thanks to Verisk Health for sponsoring HIStalk as well – I hope they keep me posted on future events so I can alert our readers. Several vendors were showing off their “big data” but weren’t ready to address the “big questions” that come with it. Having dealt with numerous EHR conversions, I’m keenly aware of the sheer magnitude of bad data out there. Those aggregating it tend to assume that the data they’re getting is good. I really pushed one of the major national vendors on how they handle data integrity and the answers were less than satisfactory. I could tell they understood the problem because they provided the example of allergy data where one vendor has separate fields for the allergy and the reaction and another vendor combines them. The rep wasn’t able to explain how they’re handling it even though they were displaying a patient chart that showed allergy data from both sources. I asked for a follow up contact, but I’m not holding my breath. CHADIS (Child Health & Development Interactive System) is a vendor I wish I’d come across earlier. We have struggled with implementing our patient portal for pediatric patients due to privacy issues, and ultimately our health system placed it on hold. Their product is tailored to the pediatric population with online screening that covers all the Bright Future requirements. They also somehow managed to obtain permission to use most of the popular pediatric developmental screeners. That doesn’t sound like a big deal, but knowing that my vendor has struggled for years to try to obtain permission to use one particular screener, it’s pretty exciting to those of us that see children in practice. CHADIS includes a research database and is interoperable with many EHRs, so I’ll be checking them out in more detail. After Mr. H mentioned he was having difficulty finding note pads, I had my eye out for them. I spotted a handy notebook at the Accretive Health booth. The gentlemen manning the booth (which was on the fringes of the exhibit hall) at the end of the day were very engaging. One of them was leadership development author Ken Jennings, who was happy to chat about his book The Greater Goal and send me home with a copy as well. I noticed his Air Force Academy ring and we talked about the difference between a military education and a civilian one. The teenager who mows my lawn wants to attend the Academy and he was kind enough to offer himself as a resource. Those little moments where we can connect as people (and not just as vendor/prospect), especially after a long day, are one of the things I look forward to at meetings. There were several people I wanted to connect with and missed, including Jonathan Handler, CMIO at MModal. Since he was in the board review course I attended, I was planning to ask his thoughts on what the vendor space thinks about the Clinical Informatics certification. My employer refused to pay for me to take the exam (they barely gave me the day off to sit for it) and I wonder if vendors are more generous. 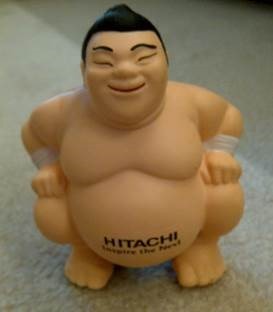 If they have certified informaticists on board and are using that for marketing purposes, they ought to! I wanted to mention a little more about the educational session I attended on Monday: “Converting Your Legal Medical Record – It’s Both Technology and Process.” I’m glad I arrived early because I had some time to look through the printed HIMSS pocket guide to figure out the lay of the land and do some last-minute exhibit hall planning. I was looking for the location of the press room and noted that HIMSS had a designated “Nursing Room.” I thought that was pretty progressive until I noticed it was in the same location as the designated “Prayer Room.” What were they thinking? Back to the educational session, the presenters were from Main Line Health (which was converting their hospital system) and Leidos Health, which assisted in the effort. They did a great job with the presentation despite some technical difficulties and had a good sense of humor about it. Having lived through multiple conversion projects, I can say that their advice was spot-on. They admitted they wish they could have started earlier and spent more time documenting the current state and figuring out how that was going to impact the new system. They talked about building their clinical crosswalk and how they planned to handle the audit trails once the legacy system was decommissioned. They had a great statement about organizational resistance: during early meetings, they spent 50 percent of the time mourning the loss of the old system and the remainder doing actual work. I’ve been to a lot of meetings like that. If only the attendees realized that no amount of begging or pleading is going to bring an old system back once it’s been marked for death, we could be so much more productive. They shared great examples of what to look out for in system conversions. The legacy system changed physician ID numbers, which created problems with providers showing up as “unknown physician” after the test extraction. Scope creep was a major issue, but many of the expanding requirements involved patient safety or risk elements which had to be considered at some level. They also emphasized the need to have two willing vendors and lamented the lack of an industry best practice in how to approach these projects. They interviewed a variety of consultants prior to the project and received many opinions on the best way to proceed. One aspect of their conversion is (thankfully) something I haven’t had to experience yet. They found that when the conversion was announced, many of the staff responsible for the legacy system pursued employment elsewhere. There was a tremendous loss of institutional knowledge around the legacy system and they had to add retention bonuses to keep them on board through the knowledge transfer. I can’t imagine what my last two conversions would have been like if I lost key staffers. They also got lucky when their go-live was delayed by another project, which resulted in an extra six months for converting data. They’re still extracting as we speak, but I’m sure that gave them a bit of a cushion. They plan to go live with six years’ worth of hospital data, which is a tremendous amount. 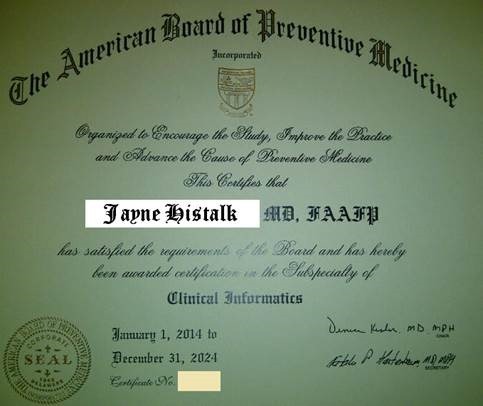 I did have one nice surprise this weekend – my Clinical Informatics certificate has arrived! All my certificates are in matching frames (courtesy of my first employer who actually had a budget for that sort of thing) so I hope I can find something that is close or at least complimentary. On the other hand, maybe I’ll go completely wild and frame it in animal print or something unusual. That would definitely start some conversations when people weave their way through Finance and Compliance to make it to my office. Those little opportunities to connect with other real people are probably the only real justification for large conference meetings, given the resources required for travel in this day and age. unless one’s employer is footing the bill. . .but then ultimately (in health care) who’s premium is paying them. etc.